So, we went to Target…many mom stories start that way. I had not been in awhile and I was pleasantly surprised at the options of organic and non-gmo lunchbox, snack and kid friendly foods. I am a big fan of this vegetarian brand. I will drive across town in the winter to buy her canned soups, chili, and refried beans. 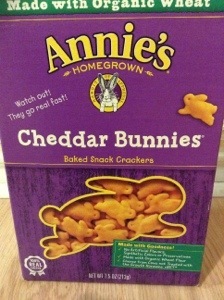 The kids prefer homemade Mac and cheese even to this brand’s boxed, but they really like her snacks. Target has carried this line for awhile and runs sales on it from time to time, but we still found something new. Fruit snacks! $3 for a box of 5, so into the Easter stash they went. Still pricey for fruit snacks, but they are already luxury status at my house and they were the same price as other brands just less snacks inside. Not a big trade-off in my book for quality. Wild planet offered albacore chunk tuna that is pole, troll and hand line caught. 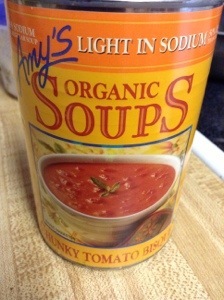 It boasts lower mercury, higher sustainability, no BPAs in canning, and no fillers. We picked up a can for less than $5. There were several non-gmo certified products to choose from. We found non-gmo go-go squeez pouches, cereals, and jam. That was all that was on my grocery list, so I will have to hunt for more next time. I think consumer voice is starting to change availability at major retailers, so whoo! Hoo! for that. Just be careful though, it needs to be organic or certified non-gmo to truly be free of generically modified organisms. Everything we picked up was $2 or less!